The organ started with a dream that was prompted by George Wright recordings and also by Stan Kann at the Fox. In those days, every one that has a “HI-FI” had to have George Wright records. So—–o many years later when the Fox reopened, they had movies with the organ being used, so I got the bug again. Then I was given some pipes, and the project started. 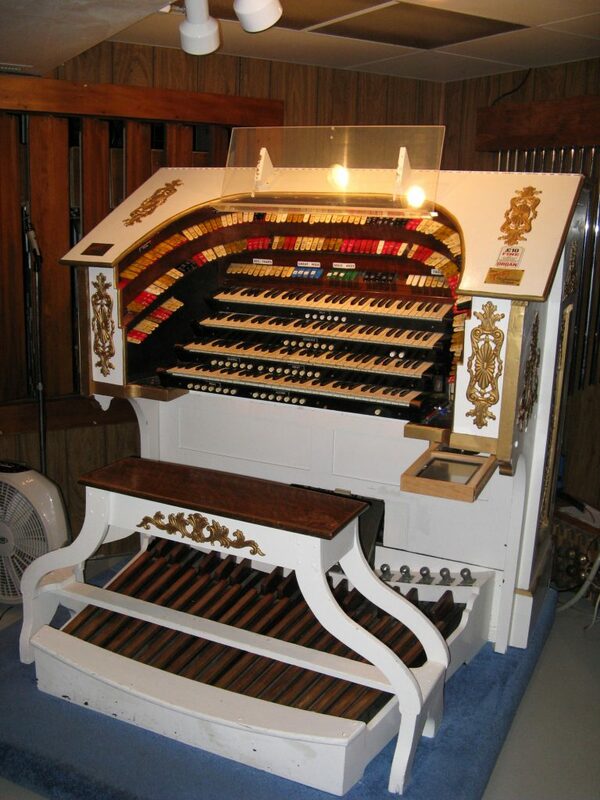 The organ currently contains parts and pipe work from A to Z, plus some electronic stops for a total of 28 ranks. The console was built from two Wicks 2 manual horseshoe consoles. Pipe work has been salvaged from any number of installations. We then reconstructed the console with a new top rail, sams and the Uniflex 2000 relay system. Future upgrades will include better keyboards, (one with second touch), realignment of the stop list, a few more tuned percussions and one more rank of pipes.